Planners like to outline. More than like. They need to outline. The idea of writing without a game plan is like being dropped into the middle of the ocean with only a pair of water wings. Sure, you can swim. But you don’t know where to go. You might find your way to shore. Or, you might end up farther out to sea. Either way, it’ll likely take you a lot longer to get there then if you had a some bobbing beacons to lead the way, and maybe a speed boat. Outlines can provide freedom. When you have a clear and detailed idea of where you’re going, you can spend more time on the journey. You don’t run as big of a risk of writing scenes that don’t matter, writing down a wrong turn, or even worse, writing into a dead end. It might give you a slower start, and you may feel like you’re never going to get around to actually writing your story. But once you do, it’ll go a lot faster. The blank page excites you. Just look at that empty canvas. So much potential. Literally anything could happen in your story. And, just like reading someone else’s book, you can’t wait to find out where it goes. Writing by the seat of your pants can lead to marathon sessions of cranking out large word counts. You might get on such a roll that you just have to find out where this scene is going to take you, and you follow it no matter how long it takes. A potential downside is that there might not always be a place for these epic episodes. Worse, those manic days of plenty might be interspersed with depressing days of word famine. But if you’ve got the time, pantsing is a good way to explore every nook and cranny of your book. You may discover things about your world and characters that you could only conceive of in the moment. In between these two extremes, there is a little something that I’m dubbing “plansters”. I’ve heard people say that they use a hybrid approach, but it normally doesn’t get discussed any further than that. I came to writing as a pantser. I was actually anti-outline at this point. With my first book, Nightfall: Wolf’s Moon, I had literally no idea where it was going. I conceived of it this way: “hey, vampire stories are popular. I bet werewolves are next. Yes! I’ll write a werewolf story!” (almost word for word my real thought process on that one. This was before I decided to be a professional writer). I wrote, the ideas came, I was excited to see where it’d go. I’d had a few false starts on other stories that just dead ended before this, but I knew that I could finish this book. I felt it. And I did. It clocked in around 50,000 words. It was YA, so I consider that length a success. I came up with what I felt was some interesting lore. The rest… well… it wasn’t very good. And when my boyfriend (at that time just my friend) pointed out all the bad parts and told me I’d have to do several other drafts, I scrapped the whole thing. With Otherworlders I went to the other extreme. I outlined the heck out of that. Mind maps, and timelines, chapter by chapter summaries… the thing was probably half written by time I started writing. And, as a result, I finished the first draft in 6 weeks. It was orders of magnitude better than the other book. I did a few more revisions, beta reads, and I’m now waiting for it back from my editor. I’m going to enter it into Amazon Scout. But, as proud of it as I am, I’ve grown since I’ve wrote that book. I know I’ve now written better. Does Plantsing make me a better writer? I don’t think that it could possibly be that simple. I’m sure that practice, study, and hours of conversations about the craft of writing, as well as lots of reading, all contribute to my improvement. But I think being a Planster, for me at least, does help. The Planner Lives: I still mind map. Activating the artistic centers of my brain help me to better conceptualize abstract thoughts, like world building and character relationships and events. With my current book, I have a very loose outline. I’ve got a couple of plot points, a few pinch points, I know where my midway is, and where the book ends. But that’s as far as it goes. The Pantser Lives, too: I have a lot of wiggle room since my outline is so loose. I can explore my worlds and my characters. I can learn things about them as I write that I never would have thought of otherwise. I’m writing in the moment. The beauty is in the harmony. I know where my story is going, and I know how to get it there, but I can take the scenic route. 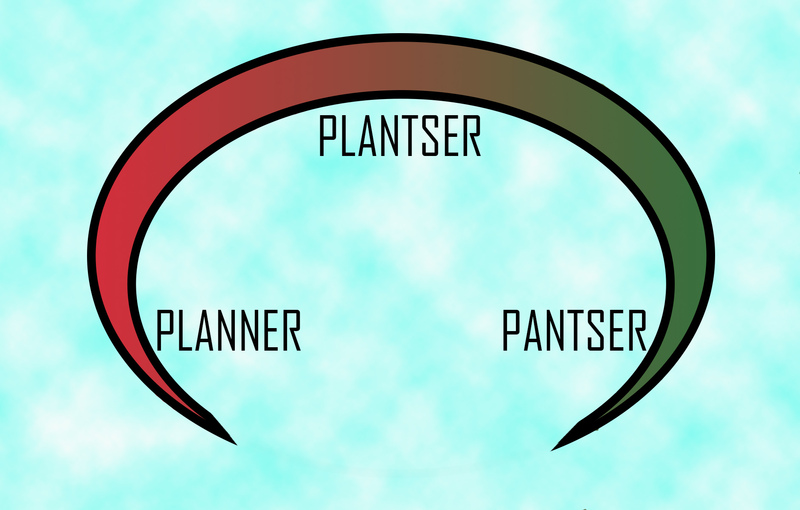 Planner, Pantser, or Plantser, do whatever works best for you. And if you haven’t, experiment with the others. You never know what you’ll like until you try it. I think I have my own category. I am a pantser I suppose in that I like to write and fill the page with the first things that pop into my head. But I also like to lay and daydream and be able to ‘see’ a story or a poem in advance. No outline, nothing solid, but a vision of what I want to get across. I suppose it is because I am trying to write novels but really I am a poet. Nice! This is what I’ve also been leaning toward. Best of both worlds! Great post!